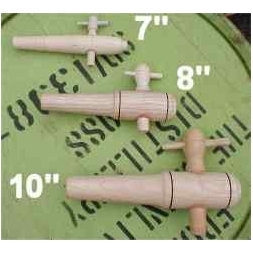 Wooden taps suitable for use in barrels. These barrel taps are tapered along their length. They are fitted by simply drilling a suitably sized hole in the barrel and hammering the tap in. If the seal is not initially completely watertight it will become so after soaking. By filling the barrel with water to just above the tap level, the tap and the barrel wood around it will swell and form a seal. This may take several hours. A hole diameter of 25mm to 32mm is suitable for fitting the 7" tap and 30mm to 34mm is suitable for 8" wooden taps. A 38mm to 44mm diameter hole is suitable for fitting a 10" tap.